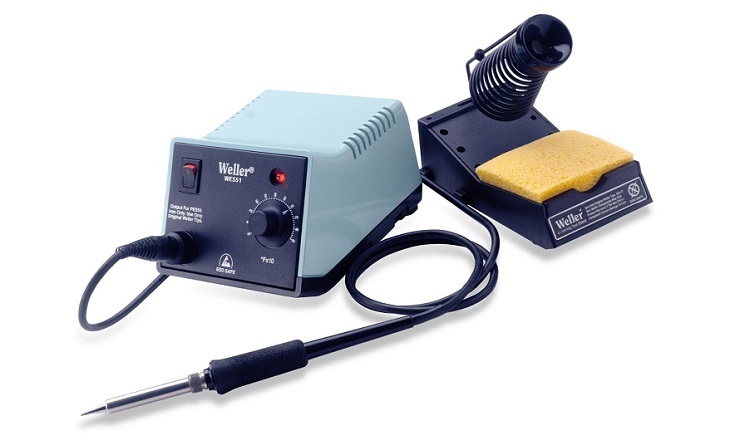 The best soldering iron for guitar repairs will vary depending on your need but if you are a hobbyist that needs to repair your own gear at home, the Weller WLC100 40-Watt Soldering Station is a great start. Its adjustable wattage makes it versatile and it comes with a soldering station making it very convenient. For the guitar repair shops out there, I recommend the Weller WES51 Soldering Station. This machine is a workhorse and can handle both light duty and heavy duty projects. Whether you are replacing the pots or upgrading the pickups in a guitar, you will need a good soldering iron. 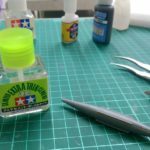 Repairing your own guitar gear can be very gratifying but that is not the only great thing about owning a soldering iron. 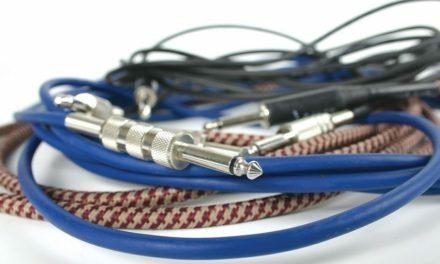 Before I started repairing the electronics in my guitars or replace parts in my guitar amps, I was building my own guitar cables for much cheaper than purchasing them from a store. When I decided to start making my own guitar cables I set out to find the best soldering iron I could for guitar repairs and cable building. I learned pretty much everything there was to know about soldering irons and what made some better than others and the different types there where. Before then, I just thought they were all the same and I should just grab the cheapest one from the store. After reading about cheap units overheating electronic guitar components I quickly changed my tune, no pun intended. Below is the guide I put together and is based on all of my research. It should help anyone out there looking to get into guitar repair and other musical gear repairs. As you can imagine, the needs for guitar repair are much different than needs for soldering irons for stained glass. 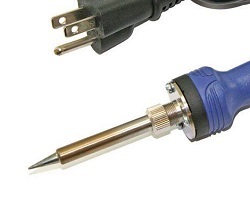 The main purpose of a soldering iron is to apply concentrated heat to the pieces you intend to connect and melt the solder bonding the two together. Most of the things you will need to solder in guitar repair are broken wires, pots, and the occasional transistor or capacitor. You will also need a soldering iron for building guitar pedals if wanted to do so. 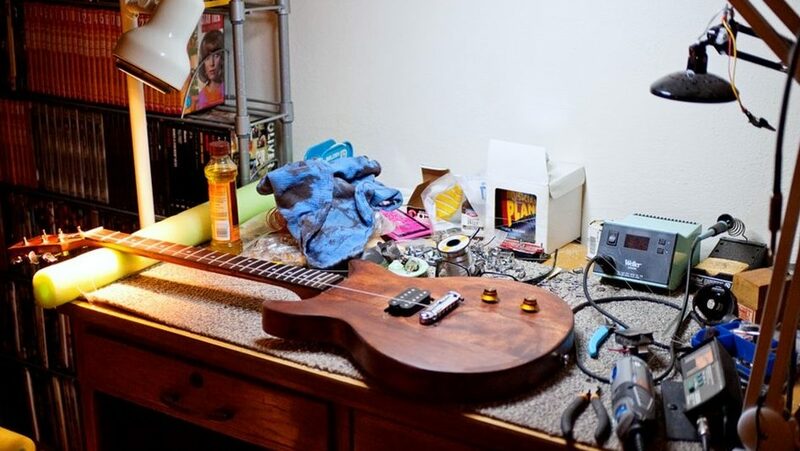 I’ll quickly go over the important attributes and details so you can choose what will work best for you to start repairing guitars, building pedals, or making guitar cables. WATTS: The wattage of a soldering iron is a general indicator of its power. However, more power is not always better and it is not an indicator of performance. It is one aspect of how quickly the iron can get up to temperature but heat retention and recovery are also affected by other components. The most common soldering iron watts used in guitar repair is between 25-50 watts. Lower power being 25 watts and used for the more delicate guitar electronics parts like pots, capacitors, and transistors. The higher watts are used to solder heavier duty parts like thick braided wires and guitar cables. ELEMENT: There are two types of elements used in soldering irons, a ceramic element and a Nichrome wire element. The Nichrome wire element is a resistance wire that uses electrical resistance to conduct heat. The ceramic element heats based on the same principle but has different characteristics. Soldering iron with wire element. Nichrome Elements used in soldering irons are usually bigger and heat up a larger metal body. This larger body conducts heat to the tip. This large body means the Nichrome equipped iron can store more heat and the tip temperature will drop more slowly. This style should supply more sustained heat enabling longer sustained use in theory. 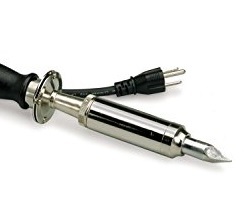 Soldering iron with ceramic element. Ceramic Elements used in soldering irons are typically smaller and heat up the ceramic body much closer to the tip. The ceramic conducts heat to the tip and translates to much faster heating times but less sustained heat. Losing too much heat can lessen the ability to liquefy the solder over time when continuously feeding it. This is really dependent on many factors though and not a hard fast rule. If you are wondering which is better, that is a trick question. For smaller units and light to medium uses, the difference should not really impact most people. In guitar repair, either will work just fine. This becomes more a matter of preference but again, take into account the type of soldering you will do; long continuous runs requiring sustained heat like that offered by the large Nichrome element, or short and quick beads which ceramic elements handle nicely. TEMP CONTROLLER: Though marketed as a temperature controller, these units actually only regulate the wattage sent to the element. Usually the temperature at the tip will constantly vary which may not be great while working. When choosing a unit with a temperature controller, it always best to buy a higher quality unit when soldering delicate electronics. 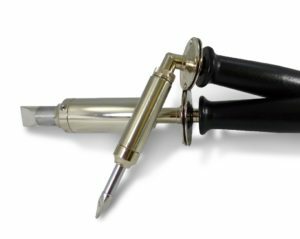 TYPE/STYLE: Handle type soldering irons are available in two different styles or configurations. The pencil style is just a straight unit from handle to tip. The hatchet style is bent up to 90 degrees where the handle and element meet giving the unit an “L” shape. This re-positions the center of gravity closer to the hand offering ergonomic feel and working angle. TIPS: There are many different tips available for irons. There is a chisel tip, an angle chisel, conical, and point tips. All of which available in varying sizes. The pointed tip is going to be best for most of your guitar repair work involving pots and switch contacts. A chisel tip is going to be best for guitar cables or large wire soldering. ACCESSORIES: When purchasing your soldering iron for guitar repair, it is good to have a few accessories on hand. A cleaning sponge or a brass coil is a must to keep you tips clean and freshly tinned. An iron stand is also a must have to keep the it accessible and shield the hot parts from accidental burns. 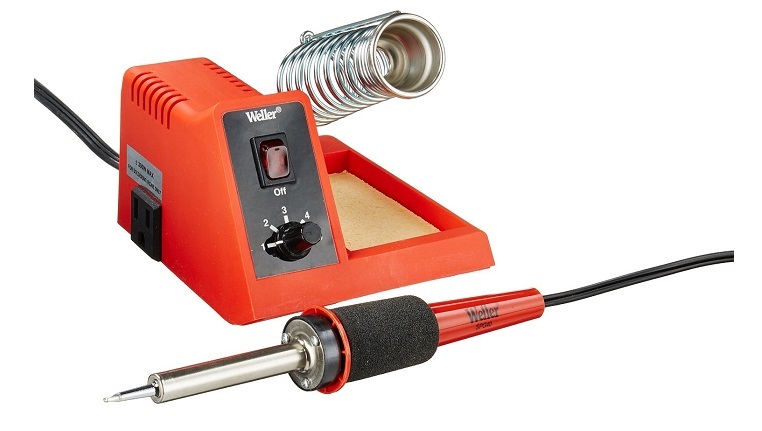 The Weller WLC100 is one of the best soldering irons for the hobbyist. It is a light duty unit that can handle any guitar repair projects you can throw at it. It can be dialed down to as low as 5 watts or all the way up to 40 watts. This allows a certain amount of protection from overheating delicate parts but the versatility to solder bigger components. It is compatible with a wide variety of replaceable tips as well adding to the versatility of this unit. The build it station stand is also very convenient when using the unit and adds protection from inadvertently burning things when not in use. This unit as well as most all Wellers use a Nichrome Element to heat the iron up and takes less than 5 minutes from cold start to max temperature. Since this is a light duty unit it is best for hobbyists and small scale work and should last a very long time. Weller is a great brand and well known for their irons. For guitar shops, you may want to go with something a bit more heavy duty like the Weller WES51. That said this is a great unit and if you end up with the WLC100 soldering iron for guitar repair be sure and get some practice in to get a feel for the ideal settings before working on your gear. 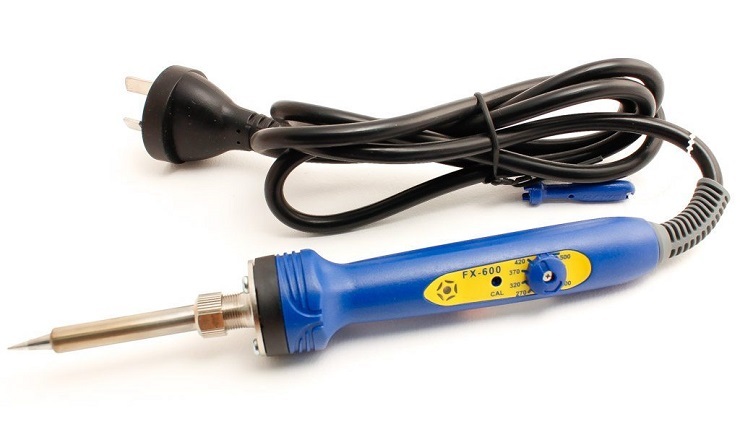 If you need portability or iron that heats quickly than the Hakko FX600 will be the best soldering iron for your guitar repair needs. The ceramic element on the Hakko heats up incredibly quick and features a dial temperature controller for any needed adjustments. This unit will reach its max temperature in under a minute depending on the tip. The Hakko unit also features the ability to replace tips with an array of choices. This unit is perfect for guitar repairs and will tackle all of the common soldering jobs you will encounter, whether it’s replacing pickups, pots, or guitar jacks. Another great unit for the guitar repair hobbyist. If you anticipate using your iron for a lot of guitar cable building or other heavy duty work, I would skip over this unit for one of the wire element Weller’s as they are better suited for heavy duty work. Other than that, this unit is just as good at soldering guitar parts and guitar pedals as the others. The main difference is the ceramic element used in the Hakko vs the wire element in the Weller’s. If you operate a guitar repair shop or do a lot of repairs on a variety of guitar parts and accessories than the Well WES51 is the best heavy-duty soldering unit you will find for guitar repairs and guitar cable building. I own this unit and have built hundreds of cables and it works just a good as the day I bought it. It has also worked extremely well on my guitar repairs. This unit will stand up to heavy duty and high volume usage with no issues. I have used the unit for hours at a time with a consistent performance every time. It also features an automatic shutoff should you forget to turn it off. 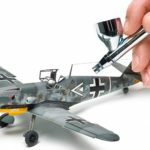 The 50 watts of available power will also get the pencil up to a temperature in under a minute as well and the wire element maintains a steady temperature. For such an amazing performing soldering iron that is capable of heavy usage it is priced well for a professional grade unit but a little higher than most hobbyists are likely willing to spend. Another really great feature of this unit is the LOCKOUT feature in which you can lock the unit to max temperature. This is great for protecting valuable electronics from inadvertent or accidental overheating when soldering. The pencil unit it also extremely comfortable and balanced, allowing you to work long periods or on delicate soldering jobs without the worry of fatigue. For anyone who has gone through countless cheap soldering pencils, this is the unit you have been needing.Lastly this unit is ESD safe which is great for protecting your electronics from electro-static discharge. Learning to solder is very easy and if you are interested in reading a more detailed guide, check out the Seymour Duncan guide, How To Solder. 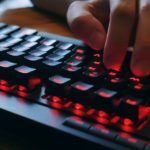 If you prefer to just get right to it, there are just a couple of tips you need to know before you start soldering on your expensive gear. When purchasing solder you should look for a 60/40 Rosin-core solder for guitar jobs. This solder is a mix of 60% tin and 40% lead and has rosin flux in the center to ensure that the solder melts and flows easily and quickly. 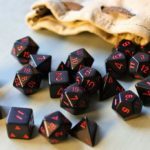 It also ensures a good bond between the two materials you are connecting. this is the most common solder you can find. The other option, albeit expensive, is a 3%-4% silver solder. This is the highest quality lead-based solder and a halogen-free flux is gentle on precious metal surfaces and the melting temperature is extremely low (356°F/180°C). This helps to not overheat delicate parts. It is also good to use liquid Rosin Flux and brush the contact points with it before soldering them. This ensures the solder will stick consistently and smoothly to the solder points. Always let your iron heat up completely to ensure the solder melts quickly and runs smooth. Heat the main contact point first before soldering. Apply rosin first if you are using it. Tin (coat with solder) each connection point first if possible. Don’t use a higher than necessary temperature. Always keep a solder sucker or desoldering wick handy. Lastly, here is a great video tutorial for everyone wanting to learn more. 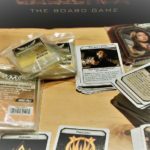 I hope you found the list and guide useful. Be sure and let us know what your experience has been with any of these or any other model you have tried!